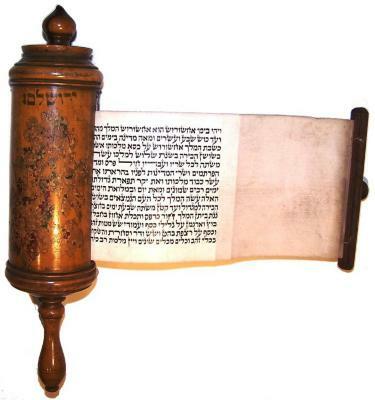 Twelve-foot long Hamelech parchment scroll shows exceptional calligraphy. Olive wood case is typical of the Bezalel School, Jerusalem. Fine turned case has pressed flower inlay, and "Jerusalem" stamped in ink under heavy lacquer finish. Bezalel School, a school for the study of arts and crafts in Jerusalem (now regarded as the national institution for the study of arts and design in Israel) was founded in 1906 by the sculptor, Boris Schatz.